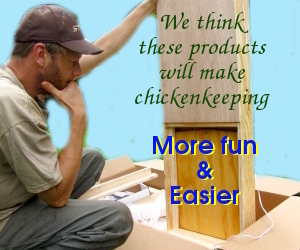 If you have chickens, I’m sure you have seen a few crazy antics. I’m always saying how our chickens always crack me up. As you know, we have the website AutomaticChickenCoopDoor.com. Recently I noticed some raccoon prints on our coop where one of the local masked bandits was trying to get in. I thought it would be a neat idea to put a wildlife camera near the coop to get a video of him trying to get in on our website. While I was setting it up, I had to point the laser aimer at the building where I wanted the camera to activate when a predator approached. This laser aimer emits a red dot on the building where you are aiming it. One of our Buff Orpingtons saw the red dot on the coop and thought it was a bug so she went after it pecking like crazy. After a couple of seconds however, the dot disappeared from the building. She was excitedly looking in every direction for where the “bug” might have gone. The “bug” however was now on her backside as it was blocking the beam of light from hitting the building. Seeing the red dot on the first chicken’s bottom, two of the other girls went after the first bird’s backside, trying to eat the infamous “red bug”. This puzzled the first bird causing her to squawk and whirled around. Now, the “red bug” was hitting one of the two birds in the backside as she was now in the way of the laser-aiming device. So, enter another bird… This bird went after the “red bug” that was on bird number two. To make a long story short, six different birds went after the “red bug” that was on the bird before it. One right after another, attacking with greater intensity than the last, as they all wanted to be the one who finally caught the mysterious “red bug”. Before it was over, all the birds were squawking in bewilderment as to why they were being pecked on and wondering where that bug went. I was nearly on the ground laughing at them. It was hilarious! There is hardly a day goes by where our girls don’t give us something to laugh at. Hence, their value to our family is getting greater all the time. Not to mention the fact that they help feed us their beautiful brown eggs everyday. Well, I just wanted to take a moment and tell you my little chicken antic story. If you have one that you would like to share, please leave a comment below. It would be neat to hear everyone’s “Antics” that their chickens pull.